Make a backup of all of your customized lessons (including those which you have downloaded which are not included in the curriculum) into Preset or Media Set files. ONLY EXPORT CUSTOMIZED FILES, not the whole curriculum, otherwise, you might not be able to use the new curriculum properly because of word-merging issues. Save the backup file(s) in a folder other than the BrillKids folder in your computer. You can easily restore your downloads and customized files by using this backup file. 1. Uninstall your current Little Reader COMPLETELY by choosing to "remove all preset settings and/or all media files" in the uninstall wizard. Click here to learn how to uninstall a program. Note: Make sure to delete all preset settings and/or all media files. 2. After uninstalling, go to Account Management > Little Math Software. 3. 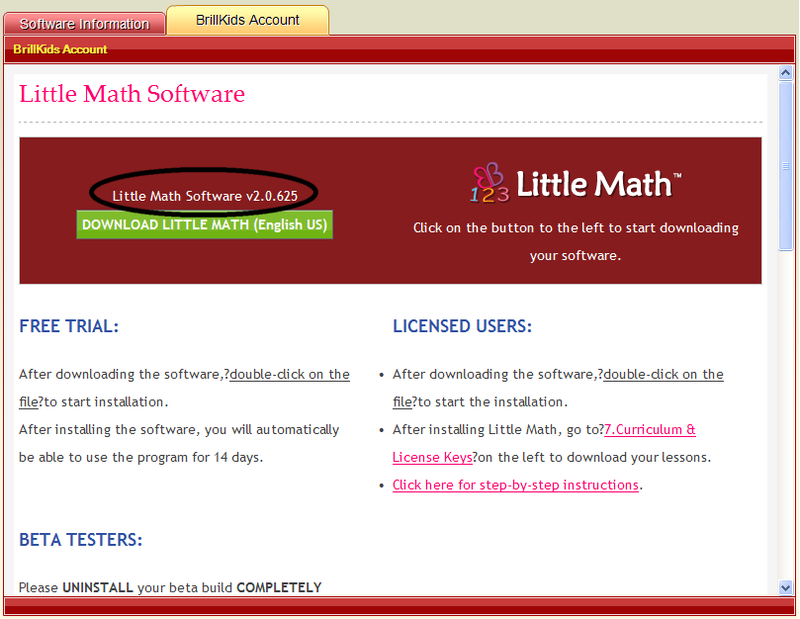 Click on the DOWNLOAD LITTLE MATH button to get installer file for the latest Little Math software version. When prompted, choose to SAVE the installer. 4. After downloading finishes, double-click on the zip file. 5. Drag the ".exe" file to your Desktop. 6. Double click on the file to start the installation. 7. After installing, go to Account Management > Curriculum & License Key. 8. Click on your license key on this page to begin importing your key and your content. 9. A message will pop up, asking you to open the link with Little Math. Click on Allow (Internet Explorer), OK (Firefox) or Launch Application (Chrome). 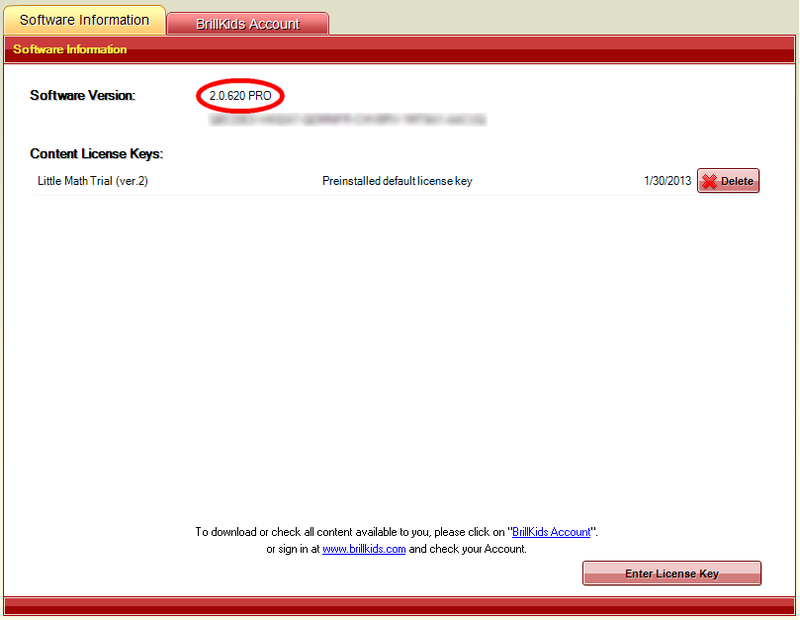 NOTE: If you get the message "License Key Already Exists", just ignore the error message. It may mean that your license key is already in your PC. [Optional] After installing, you may want to import the customized and downloaded files you backed up previously. Double click on your exported files to import them. 1. Connect to the Internet and launch Little Math, and it will automatically check for updates. 1. Connect to the Internet and launch Little Math. 2. Go to Tools, then click on Software Information on the left. The current version you have installed will be displayed in the "Software Information" panel (encircled in red above). 3. 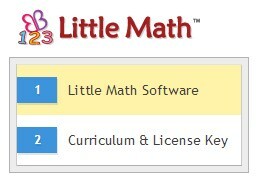 In the "BrillKids Account" tab, sign in to your account and the newest version of Little Math will be displayed in the Software Download section of the panel (encircled in black below). If the current version number of your Little Math is lower than the newest version of Little Math, click on Download Little Math to get the installer for the new version. When asked if you want to "Open / Run" or "Save" the file, choose to Save the file. 4. Once the download is done, close Little Math and open the *.zip file you've just downloaded. Double-click on the "Little_Math_X.X_install.exe" file inside to start installing. 5. The InstallShield Wizard will automatically detect that you have an old version of Little Math installed and it will proceed with the upgrade process. Follow the prompts to finish upgrading your software.. If you are encountering problems while upgrading via the methods above, you may simply visit your BrillKids Account using your browser, and download the new installer for Little Math manually.